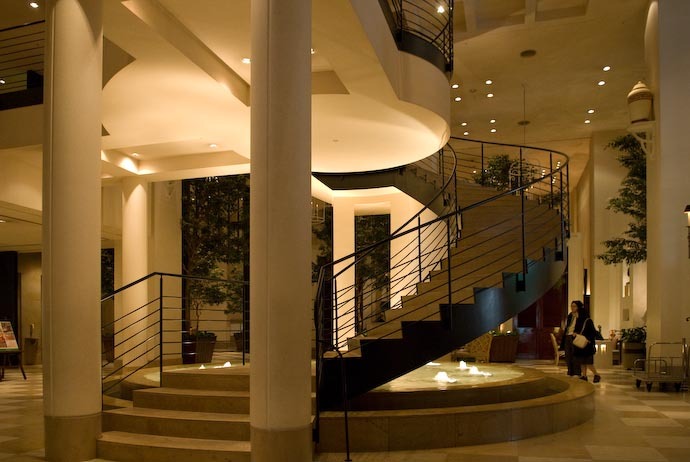 Anyway, earlier today I was killing time in the hotel lobby after we checked out when applause erupted from the hotel's “wedding chapel”, and the couple above emerged. Even at f/1.4 and ISO 800, the darkness called for a 1/45 sec exposure (much too slow for 85mm), but I like how it came out nevertheless. I have no idea who they are, but they certainly look happy. 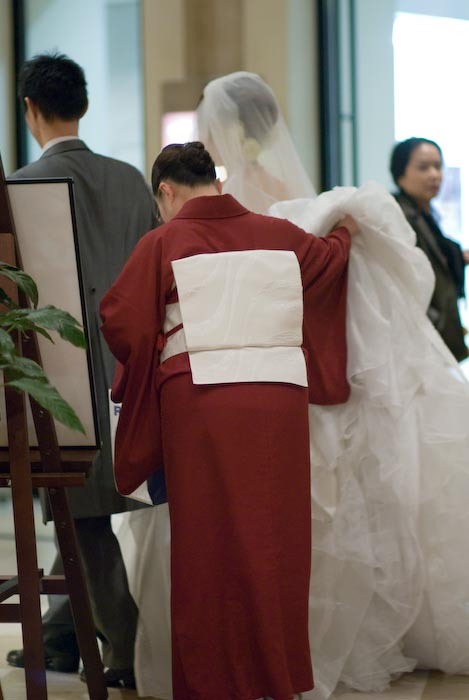 The lady in the simple red kimono is the bridesmade in the most literal sense: she's hotel staff who walks the bride (figuratively, and often literally) through the events of the wedding, from the dressing through to the end of the formal reception. 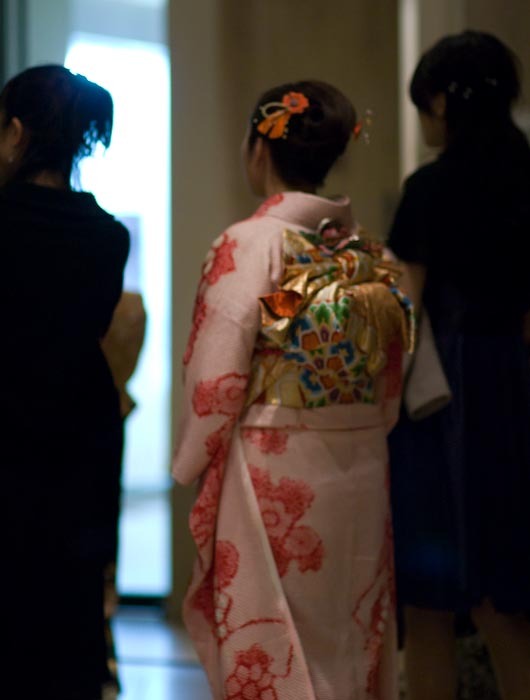 Except for when the bride is walking down the aisle, the bridesmade – hanayome kaizoenin 花嫁介添人 – is never more than a step or two away, thus (hopefully) ensuring a stress-free event for the bride. She soon turned and joined him in looking at me with a big smile. I didn't realize that he'd been smiling at me (not having realized that they could even see me through the reflections that were certainly there). I wish I could send them a copy of the shot. 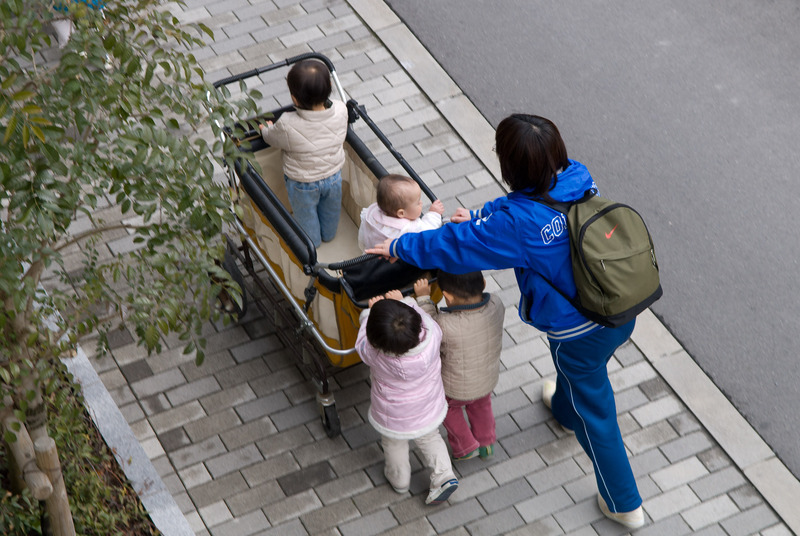 It's common to see kids – from infants to maybe two years old – being wheeled around in buggies like this, sometimes six or eight in the larger ones. It's a safe way for playcare teachers to get them out and about, and I find it absolutely adorable every time I see it. In the shot above, I love how the “bigger” kids (who can't yet be two years old) are “helping” the teacher push. Woah… I love Kanazawa. Last time I was there was in Dec. 2005. It was a pretty cold winter loads of snow and a lot of fun. I had Shiro Ebi for the first time… yum!! I also had Shirako for the first time in Kanazawa, I have to say it was damm good, but I know what it is now, I am not sure I would have the inclination to try it a 2nd time. What is “Shirako”? Nice Post, Jeff. Hope you’re feeling better soon. Well its the Seminiferous tubules of monkfish loaded with their sperm, and quite a local favorite in Kanazawa at the right time of year. That’s one big baby buggy! Cool idea, though. It looks fun. Maybe Marty & I should get one for our two kids to ride in. 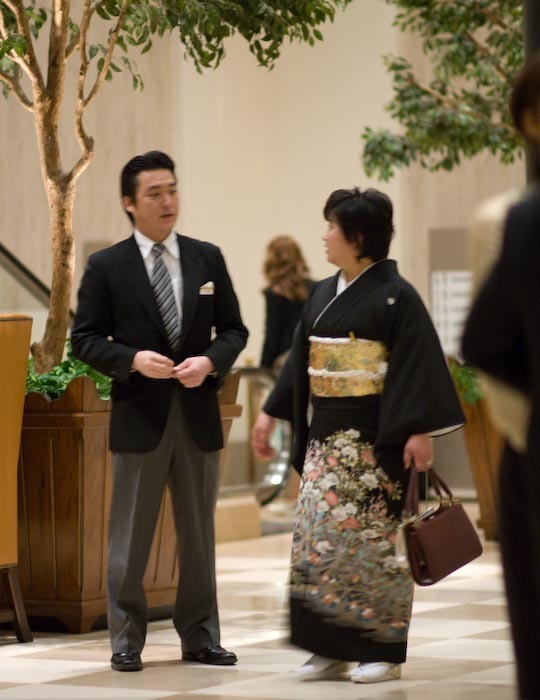 I stayed in Kanazawa for a year as an intern at the local newspaper back in the early 1990s. 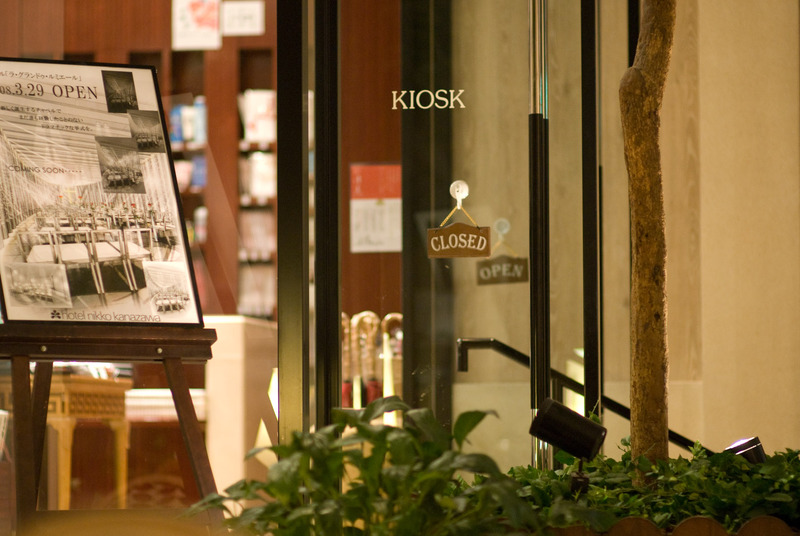 It is a special place; I particularly like parts of Teramachi, Utatsuyama and also Nodayama Bochi. I also liked the university which was still at its old site at that point. While it’s special in other ways the city is also mind-bogglingly parochial and insular. As an example, I visited a famous Kanazawa restaurant famous throughout Japan that regularly got customers from all over the country (and this was pre-internet) to interview the kami-san there. It was an interesting chat, but the thing that sticks in my mind is her frank comment that she would never be accepted in Kanazawa society partly because she had “only” lived there 30 years with her husband (who was from Ishikawa prefecture) but chiefly because she was from Kyoto. As she put it “Kyoto can be insular, but it’s a city with commerce and business links to the outside world as well as culture, whereas culture is all Kanazawa has, so they have no sense of perspective”. Nice place to visit, wouldn’t want to live there with a Japanese wife and family.